WHO, which works in concert with the DRC’s Ministry of Public Health, can’t distribute the vaccine as widely as it would like, however, because of limited supplies, Salama notes. And the obvious targets for vaccination—people who have had contact with cases—have been difficult to identify and reach because of the ongoing conflict; a small number of front-line health care workers have even been caught in the crossfire. So far the outbreak has tallied some 500 cases, about half of whom have died, according to the DRC’s Ministry of Public Health. It spans a region of the DRC’s northeast that abuts four other countries, and Salama and many others worry about the deadly virus jumping a border, which would require separate response teams and boost the potential for wider spread by infecting people with increased transportation options. Without more financial and personnel support from wealthy countries, the situation could explode into a long-running calamity similar to the Ebola epidemic that devastated three West African countries from 2014 to 2016, warns an editorial published last month in The New England Journal of Medicine (NEJM). A consensus statement from 25 public health and policy experts published the same week in The Journal of the American Medical Association calls the outbreak “exceptionally” dangerous. The editorials urge the U.S. government to change a policy that prevents its Centers for Disease Control and Prevention (CDC) from sending staff to the region because of security concerns. And many are calling for a WHO-established review committee to designate the outbreak a Public Health Emergency of International Concern, which could drive more countries to contribute to the response; in October, the panel said the designation wasn’t yet necessary. Although the toll so far is much smaller than the West African epidemic’s 28,000 cases and 11,000 deaths, it’s now the second largest Ebola outbreak ever documented, and one of the longest running. The outbreak has hit mothers and their young children especially hard, because many sought care for malaria at health centers that unknowingly have Ebola cases. Women have made up 62% of all cases, and 24% were children under age 15. Only about 50% of new infections are in people previously identified as having been in contact with a case, which underscores how the violence has interfered with contact tracing. Salama says funding for the response in the DRC has been ample so far, but will run out in January 2019. Programs to support readiness and preparedness efforts in nine neighboring countries need another $45 million, he says. He’s particularly worried about Uganda, Burundi, Rwanda, and South Sudan, all bordering the DRC. “If there is a case, as is very likely in surrounding countries, we want to pick up that first one so we can have a very robust response,” Salama says. 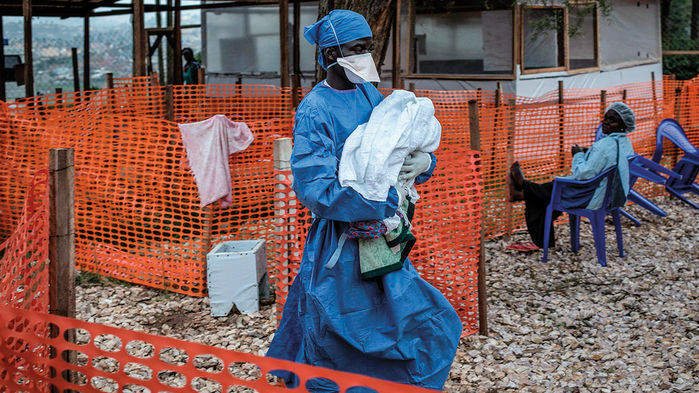 He adds that the front-line responders from the DRC, WHO’s 300 staffers on the ground, and personnel from nongovernmental organizations such as Doctors Without Borders and ALIMA are “frankly exhausted” from working long days in a conflict zone. “Where can we keep finding these brave people who are expert in viral hemorrhagic fever and know how to operate in a conflict-affected area?” he asks. CDC has perhaps more people with this twin skill set than any other institution in the world, and it’s working closely with WHO and others—but not in the hot zone. Salama says the complexities of this outbreak, such as the surprising role of malaria cases, require a nimble response, which would make CDC’s seasoned staff invaluable. “A senior leadership cadre has long-term experience and can help drive teams in the right direction,” he says. Epidemiologist Jennifer Nuzzo, who co-authored the NEJM editorial and also co-signed the consensus statement, hopes the pressure will lead the U.S. government to rethink the policy of keeping CDC out of the region. “The situation is serious enough that we’re pulling all the levers we can,” says Nuzzo, who works at the Johns Hopkins Bloomberg School of Public Health in Baltimore, Maryland. Salama, however, is skeptical the editorials will change the U.S. government’s position.